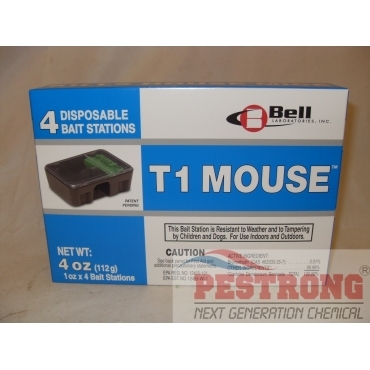 Where to Buy T1 Mouse, T1 Mouse Disposable Bait Stations DM4814 - 4 Packs - $13.55 for Sale with Fast Free Shipping! 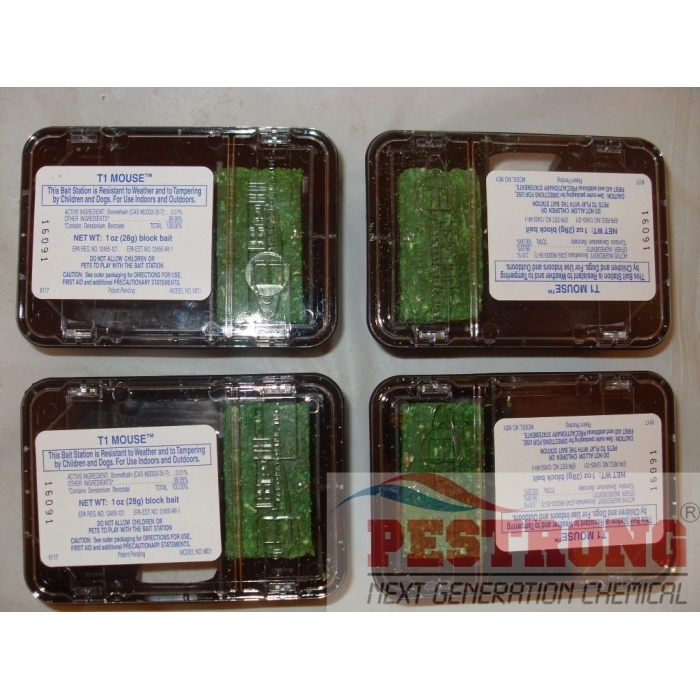 T1 Mouse Disposable Bait Stations DM4814 - 4 Packs has what it takes to control mice in residential accounts - child and dog resistant, pre-baited and effective on house mice. Consists 4 disposable bait stations in a box. T1 Mouse is pre-baited, saving PMPs valuable service time. Technicians simply place the bait station where mice travel and let the 1 oz extruded bait blox do its work. Because the station is disposable, it can be left at the account and thrown away when the bait is consumed, eliminating the need for return visits. And, T1 Mouse is child and dog resistant, a key factor in using it in residential accounts. The T1 MOUSE is a pre-baited disposable bait station, which includes an acute rodenticide containing the active ingredient, Bromethalin. This 1 oz extruded bait blox which kills house mice in a day or two. With bromethalin, house mice stop feeding after consuming a toxic dose, and it poses low risk of secondary poisoning. The station meets the highest level of tamper-resistance, recognized by the EPA. T1 MouseTM is your go-to station when you are concerned with security, quality and convenience. It is tamper-resistant to both kids and dogs, making it an ideal option for residential accounts where protection of children or non-target animals is a prime concern. The disposable station can be left at a residential account and thrown away once the bait has been consumed; allowing technicians to service the account quickly and leaving more time for other value added activities. APPLICATION DIRECTIONS: Place the bait station at highest point of activity beside burrows, along a wall or in corner where mice or their signs have been seen. If additional units are purchased, the bait must be placed at 8 to 12 feet intervals. Maintain an uninterrupted supply of fresh bait for at least 15 days or until signs of mouse activity cease in infested areas. 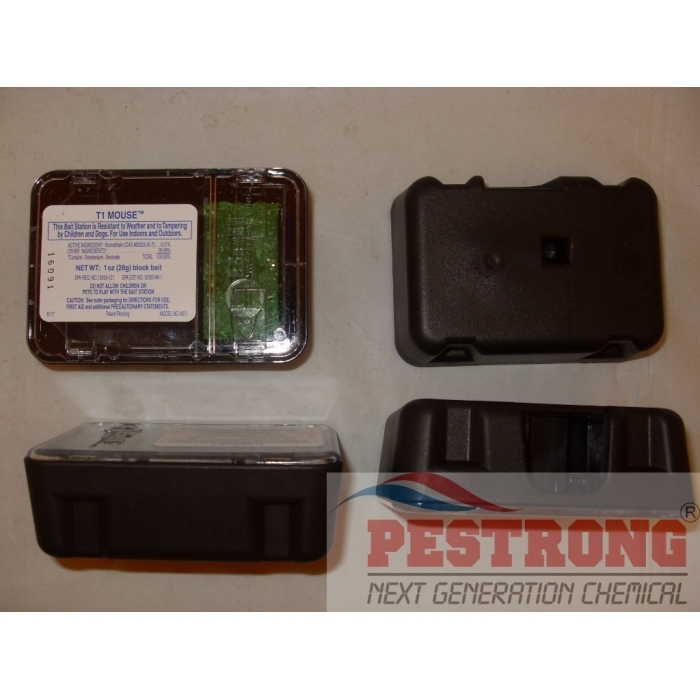 Replace bait station when bait is consumed or contaminated. Great product to use in small apartments or condos. Quick and easy to deploy, and just as quick and easy to dispose of after all the baits been eaten. The clear top is great for finding out if the bait is gone and the station needs to be switched out. This is a quick and simple way to get rid of a mice infestation.